If this were Twitter, I wouldn't have the feeling I had to add anything to the title (and could go to bed now). 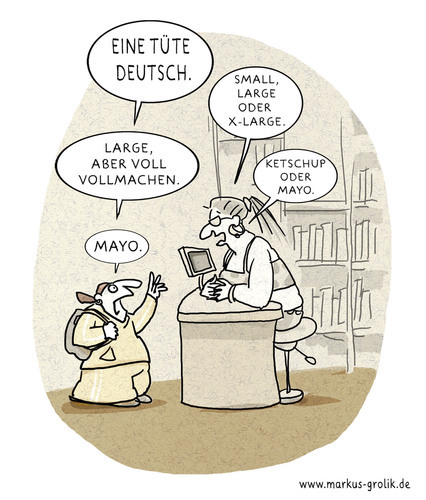 I'm completely immersed in German. Hausaufgaben jeden Abend... I have been preparing my second oral presentation tonight. Next week we also have our final exam already. There are definitely pro's about this concentrated way of learning a language (every morning for three weeks). My level is improving at lightning speed. I already watched a few good movies in German last week and I started reading a detective in German yesterday, all very doable. 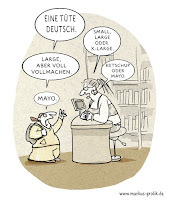 Of course, it helps that German is so similar to my Dutch and it turns out that once you have learned a language before (I learnt German during secondary school), you don't forget it - you just have to find it back in your memory somewhere and then upgrade it.